Yellow marsh marigold (Caltha palustris var. palustris), also called common marsh marigold, is found throughout Minnesota except for the southwest corner of the state. It almost always occurs in wetlands. It is found in full or partial sun in woodlands and on meadows, marshes, and streambanks. The large, showy, yellow flowers appear in April and May. 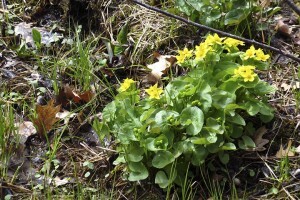 This entry was posted in Plants and tagged Caltha palustris var. 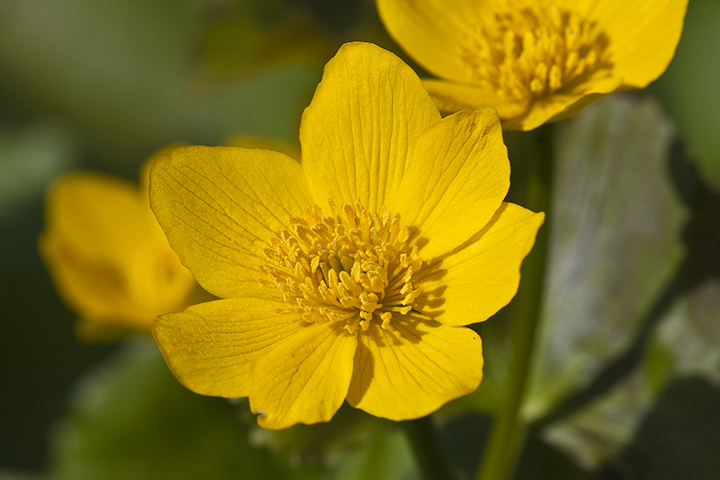 palustris, Yellow marsh marigold on April 29, 2014 by John Valo. Turkey Tail (Trametes versicolor) is the most common polypore, and one of the most common mushrooms, in North American woodlands. It is found on logs and stumps of dead hardwood trees, especially oaks. It is sometimes also found on wounds of live trees. It is rarely found on conifers. It appears in the spring and persists through the summer or fall. 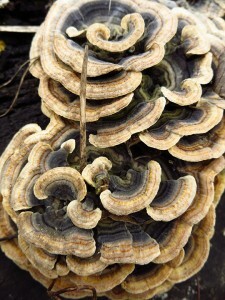 The fan shape and concentric rings of contrasting colors look like a turkey tail, giving this mushroom its common name. 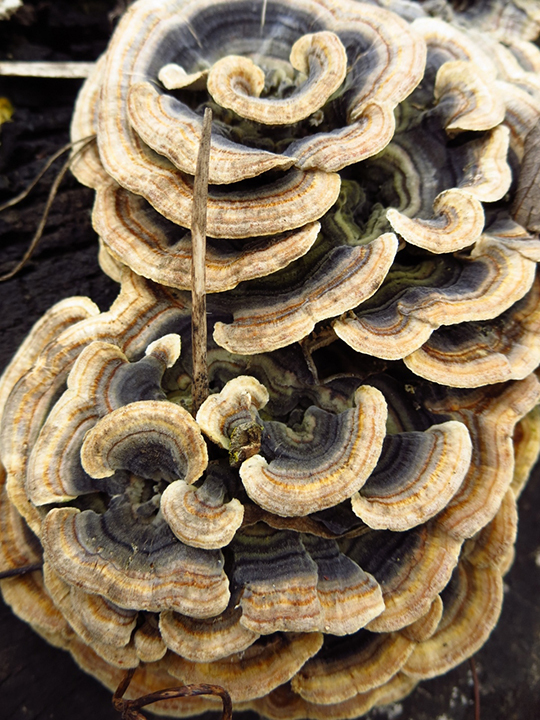 This entry was posted in Fungi and tagged Trametes versicolor, Turkey Tail on April 28, 2014 by John Valo. The song of both male and female Northern Cardinals (Cardinalis cardinalis cardinalis) is a series of clear, bubbly notes that have been describes as woit, woit, woit, chew, chew, chew, chew, chew or pichew, pichew, tiw, tiw, tiw, tiw, tiw (Sibley); and cheer, cheer, cheer or birdie, birdie, birdie (Cornell Lab of Ornithology). It is a learned song and varies by region. In the spring a male seeking to attract a female gives an inspiring vocal performance that must be listened to for several minutes to be fully appreciated. It begins with a series of just five or six notes; woit, woit, chew, chew, chew. After a pause of few seconds the series is repeated, increasing the number of chew notes by just one. This continues for several minutes, each time the series increasing by just a single note. The series will often get to 18 to 20 chew notes. One series I counted reached 24 chew notes. 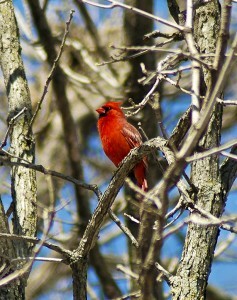 You do not have to be a female Northern Cardinal to be impressed by such a performance. I have yet to hear a recording or read an account of this extended series of calls. 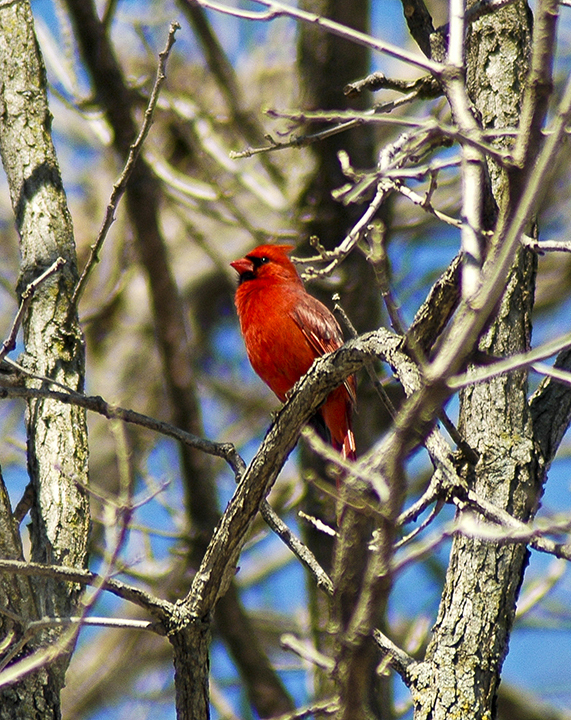 This entry was posted in Birds and tagged Cardinalis cardinalis cardinalis, Northern Cardinal on April 28, 2014 by John Valo. Large yellow lady’s slipper (Cypripedium parviflorum var. pubescens), also called greater yellow lady’s slipper, is found throughout Minnesota except for the southwest corner of the state. In most of the state it occurs in moderate or deep shade in moderately moist upland forests. In the northwest corner of the state it occurs in full or partial sunlight in wet prairies and sedge meadows. The large showy flowers appear from May 10 to July 10, with peak blooming time June 5 to June 20 in the north and May 20 to June 1 in the south. Do not touch. The hairs on the stems and leaves cause dermatitis in some people. This entry was posted in Plants and tagged Cypripedium parviflorum var. 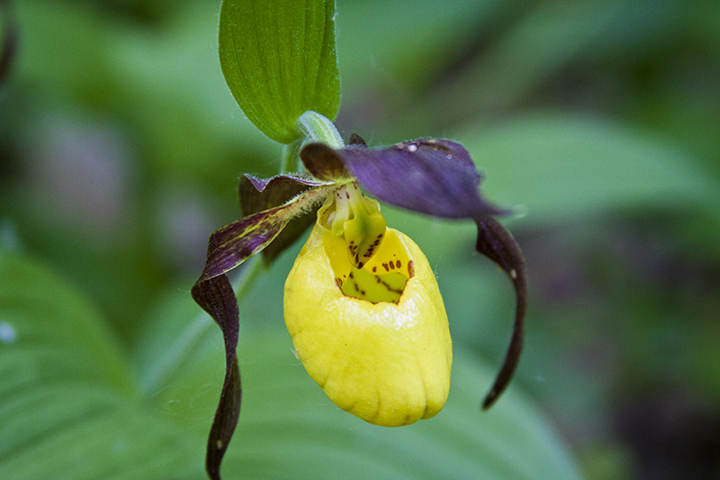 pubescens, greater yellow lady's slipper, large yellow lady's slipper on April 8, 2014 by John Valo.